An easy to make beef loaf made of ground beef and with the use of extenders such as ground mushrooms, breadcrumbs and vegetables such as sweet pickles, green peas, pimento, and seasoning. Topping and garnishing includes hard boiled eggs, crushed pineapples, olives and parsley. A great dish that can serve as viand and in lunch, dinner or breakfast. 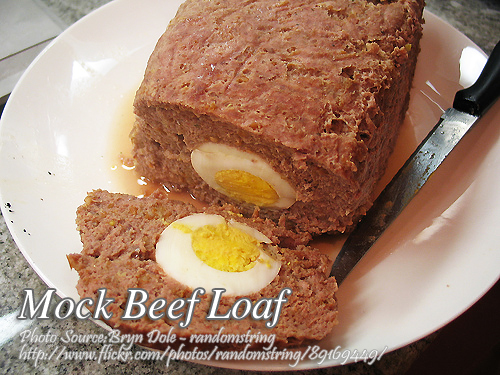 To cook mock beef loaf; Combine all ingredients very well except crushed pineapples and hard boiled eggs. Grease well a loaf pan and line bottom with slices of hard-boiled eggs and then with crushed pineapples. Pour the meat mixture in the loaf pan and pack very well. Bake in a moderate oven 350 °F until cooked. Serve with catsup. Garnish with olives and parsley. Combine all ingredients very well except crushed pineapples and hard boiled eggs. Grease well a loaf pan and line bottom with slices of hard-boiled eggs and then with crushed pineapples. Pour the meat mixture in the loaf pan and pack very well. Bake in a moderate oven 350 °F until cooked. Serve with catsup. Garnish with olives and parsley. Serve hot.